Be forewarned, this is a big book. It's a modern book. It uses all the techniques necessary to keep modern readers attentive: sidebars, bullet points, and copious illustrations. Build Your Own Small Wind Power System has a number of useful illustrations and photos that, frankly, I don't have in my books. So, even this old dog has to learn some new tricks to stay current. Privately, I've complimented Brian Howard on some of his photo picks. Some of the photos are in the public domain and good enough I might very well use them myself. I can't think of a higher compliment than to use a few of those in one of my books. As a journalist, Brian Howard has one weakness. He feels it's necessary to present both sides of some of the debates swirling around small wind turbines. He's good at presenting the weakness of some of the arguments, such as those promoting small vertical-axis wind turbines, and if you can read between the lines you can guess where he stands. But he doesn't say unequivocally that some of these designs are a waste of time or that their promoters are simply hustlers and charlatans. Fortunately, he does quote me and Mick Sagrillo liberally. And no on has ever accused either one of us of being subtle. Nevertheless, any vibrant, growing industry needs new blood and that new blood will, by necessity, do things their way whether the gray beards like it or not. Everyone makes a contribution even if it's two steps forward and one step back. We're still making progress. 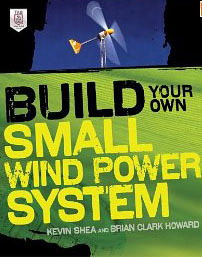 Two big pluses for Build Your Own Small Wind Power System are the authors' emphasis on swept area rather than power ratings. And the authors' clear preference for feed-in tariffs as the policy mechanism that is most likely to make small wind come of age in the US. If readers take nothing else from the book, these two lessons alone are worth the cost of the book. And no other policy mechanism has done more for renewable energy development worldwide than feed-in tariffs. The authors get it when some of America's leading renewable energy advocates don't.